Whether you're building a book shelf, measuring a wall for a new couch, or trying to hang your photos straight, most of the time you'll need a tape measure. Most homeowners have at least one of these yellow-godsends somewhere in their toolbox or kitchen drawers. Even the newest builder can grasp the concept of a tape measure. Your tape measure will tell you inches and feet (and sometimes meters/centimeters). But, there's one little mark on the tape measure, most people ignore (or chalk up to a manufacturer design). The red boxes on a tape measure indicate the most common distance between studs in homes and traditional buildings (16-inches apart). The black-boxed numbers are similar. Spaced 24-inches apart, these markings are for stud-placements in smaller buildings (like sheds) where the weight load is lighter. These number boxes make quick work of marking lines for stud placements. What do the black diamonds mean? 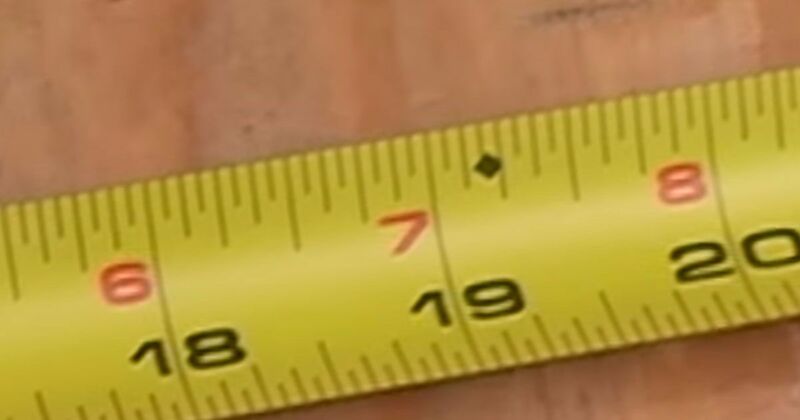 The black diamond marker on a tape measure falls between the 16-inch and 24-inch spacing. This marker is commonly used in building a concrete block chimney. But, it has other uses too. Marked at 19.2 inches apart, using this type of placement also allows for more weight loads with fewer pieces of wood. New Wood Worker notes that while this can save money, it may not meet building codes in all areas. If you aren't planning on building a house, you can still use these numbers to build a sturdy shed or find studs in the wall of your home. (If the 16-inch measurement isn't working, try the black diamond next.). Watch the video below to see a visual of how the different measurements look when laid out in a beam setting. If you found this information helpful, don't forget to share it with your friends on Facebook.